It’s as if it’s programmed into them. As they become teenagers, suddenly kids are staying up later, usually a lot later, and don’t want to get up in the morning. Give them half a chance and they’ll sleep in until ten or noon. That can be annoying on a school morning, and upset your whole household routine. It’s as if their whole system has gone out of kilter. In fact, according to research, that’s exactly what happens. 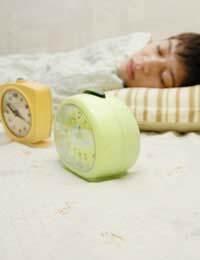 Instead of producing melatonin around 10 pm, like most of us, teenagers don’t produce it until 1 am, meaning they’re awake and alter much later. That’s why it can be almost impossible to prise them away from the computer, video game console or TV at night. Whether it’s all due to behaviour or hormonal, no one knows yet, but it exists. They still need sleep, of course – in fact they need more of it than either adults or children for their growth – but going to bed later means they do actually need to sleep later. So dragging them up at eight on the weekend when they haven’t fallen asleep until one or two is, in fact, a bad thing. Medically, the best thing you can do is simply let them rest. Of course, that’s not possible on days when they have to go to school or work. They have to be up, and that means, in many cases, you have to get them up. It’s frustrating, and simply insisting that they go to bed earlier isn’t going to work if they’re only going to lie there awake. Is it possible to find a compromise? Possibly. A good alarm clock will help, as well as instilling as much self-discipline in them as you can. But it’s still not going to be perfect, and there will still be mornings when you’ll have to drag the duvet off them and shepherd them out of the door. In general, weekends are a little easier (unless they have a paper round or a Saturday job, of course). You can simply let them sleep later. But it can seem galling when your teen stumbles into the living room at noon or one after you’ve already been up for hours. Just tell yourself that they really need the sleep, and possibly set a limit – they have to be up by noon at the latest, for instance. Many teens are very social. They’re out with friends at night, sometimes very late indeed, and you find yourself lying awake, worrying, and listening for the sound of the key in the lock. Going out is fine on the weekends, when they don’t have to be up early the next morning. But with many teens, certainly up to the age of 17, you should have times by which they need to be home. Sit down and discuss these with them. Give your reasons for picking a certain hour and listen to their inevitable arguments against them. Allow them to be later with notification (they have mobiles, they can call) and a very good excuse, as long as it’s a rare occurrence. But make it clear that breaking curfew without that will result in being punished. After the first time it happens, they’ll believe you! Make a good distinction between weekdays and weekends. The next time it’s noon and you go up to wake them, try to remember that they were once your little angels – it helps!